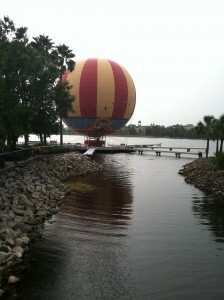 The Characters in Flight Balloon found in Downtown Disney’s Westside is now taking guests high in the air once again. The balloon was grounded a few months ago, when an accident occurred in Hong Kong. Originally, all balloons operated by the company Aerophile, who runs the balloon in Downtown Disney, were inspected. This was done because the accident that occurred in Hong Kong involved a balloon that is similar to the one found in Downtown Disney. A new balloon has now returned to the area. I enjoyed this experience when we last visited WDW. FANTASTIC!! This was one thing I really, REALLY wanted to do our first night on the property! So excited! !